For a more immersive Caribbean experience, why not visit more than one island? 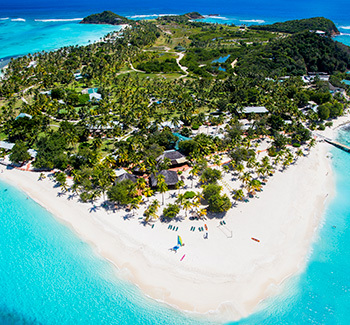 Palm Island Resort & Spa in The Grenadines offers an array of optional excursions to nearby islands. Sail aboard a catamaran to discover the Tobago Cays, a cluster of five uninhabited cays that were a film location for Pirates of the Caribbean. Hop over to Union Island for a delicious lunch. Or sail over to St. Vincent to explore its botanical gardens, historic Fort Charlotte and more. Your All-Inclusive private island hideaway in the Grenadines awaits. Come experience Palm Island's singular blend of white-sand beaches, rustic elegance and authentic Caribbean charm. This Adults-Only resort is perfect for weddings, honeymoons and romantic escapes. Enjoy a range of amenities, dining options and accommodations. Here you can rediscover the wonder of nature as you slow down, relax and recharge.